Last week, a dear friend brought us several different types of sausage that he had gotten from a local smokehouse. One of the varieties was a Bohemian Smoked Sausage. I have never tried it before and wasn’t sure of all the spices in it, but knew I wanted something special to serve it up with. This was the result and it was delicious! Add the chicken stock and tomatoes and bring to boil. 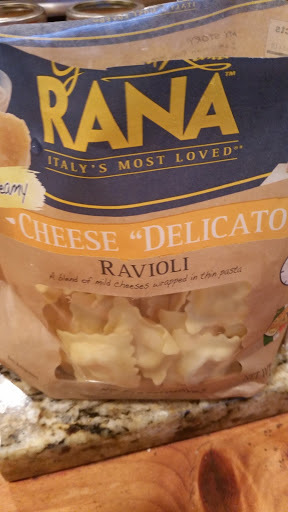 In the meantime, cook the cheese ravioli according to package directions. 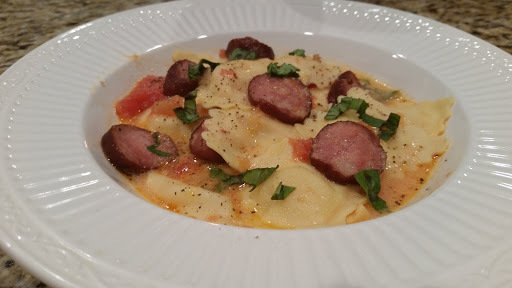 Homemade ravioli is easy to make but for this dish I used store bought. Add the cream to the stock and bring to a simmer. Add the ravioli and heat through. Because of the spices in this sausage, this really needed no extra spices other than salt and pepper to taste. Depending on the sausage you use, you can add the spices of your choice. 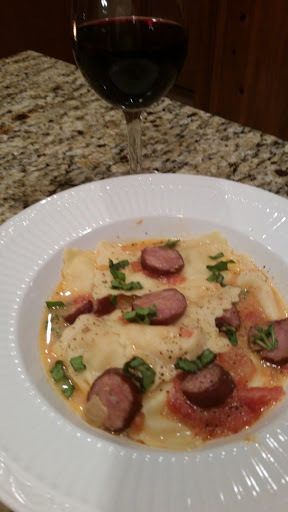 I added fresh basil to finish but that is totally optional. This was so simple but so good!